Jordan Henderson has said Liverpool without Steven Gerrard would be "unimaginable" and insists he remains the player team-mates look up to. 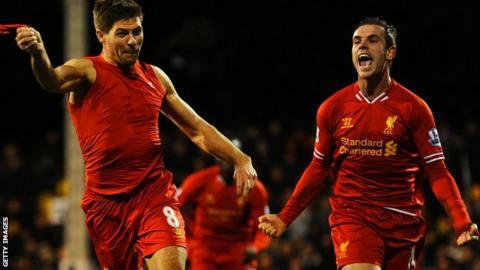 Midfielder Henderson, the vice-captain at Anfield, hopes Gerrard's future at the club will be resolved soon. Gerrard, 34, has been offered a new contract and scored on his return to the side against Leicester on Tuesday. "Nobody wants to lose him - Liverpool without Steven Gerrard is unimaginable," Henderson said. The former England captain's current deal finishes at the end of this season. He has been at Anfield for his entire career. Henderson, 24, added: "I hope he stays on for as long as he can and then even after that really. "If he was to go, he would be a massive loss. Hopefully it doesn't come to that. "For me, he has been the best player for a number of years, not just for Liverpool but in the Premier League, and I think he still is. "Hopefully we keep him because he is a massive player for us and a great leader. "Everyone has a lot of respect for him in the dressing room. He leads by example. He is a top player, but he is also a top person."